My first run of the week was on Tuesday, which combined a commuter run with a speedwork session. The run into work was at a relaxed and easy pace, leaving the first couple of miles of the run home to build up speed. True to last week’s plan, the speedwork consisted of pushing full pelt for four lampposts along Embankment, recovering for one and then repeating. Carrying my rucksack and trying to improvise starting and ending points when the lampposts became irregular (around bridges, monuments and piers) probably meant I didn’t get the best out of the session. However, it felt tough and I think it achieved my aim of getting outside of the limited range of gears. These short bursts should have been at sub-6 minute mile pace, which is where I want my threshold run be. Wednesday saw my first run with the Serpentines this year. My best-laid plans for running their Wednesday 7.2 miles have so far fallen to the wayside, and eventually I’ll reconcile myself with the fact that Wednesdays are bad days for me. The Wednesday group always under-eggs the pace, so while no one stepped forward to run 6:30 miles, there was a decent group of us prepared to run 7:00 miles. We set off and I found myself pushing the pace, taking a few other runners with me. Around Green Park I got talking to one guy who was training for the Paris Half-Marathon, and despite running quite fast (the lighting was pretty poor, so I wasn’t able to check the mile splits as we ran) I felt comfortable and in control of the speed. Coming to a stop at Speaker’s Corner it turned out that we’d been running at 6:27 pace. Despite a decent cool-down run on Wednesday (I ran back to Euston to catch the tube after jog club), my Achilles tendon in my left foot was feeling very tight on Thursday morning. I decided to take it easy and catch the tube into work and see how I felt about running home later in the day. A day of intermittent stretching and walking on tip-toes later, my heel was feeling much better. I ran home at an easy pace, focusing on my footfall and easing out my tendon. Fridays are the hardest running days of my week at the moment because I’m trying to pick up the pace of my threshold run. Or at least make my threshold run stand out from the pace of my other runs. The pace of first and last mile and a bit is dictated by road crossings, but the two laps around Regents Park are virtually interruption-free, depending on walkers. This week’s run felt tough, which may have been related to the combination of headwind and chill, despite each mile passing resolutely above the 6-minute mark. 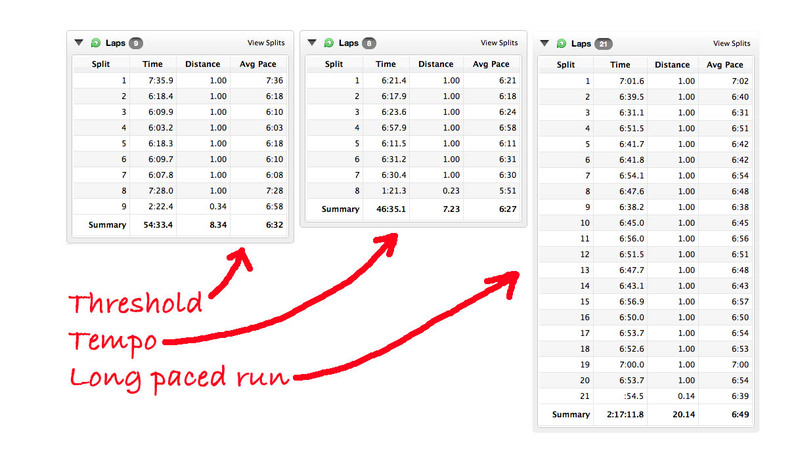 And while last week’s threshold run included a 5:59, this week’s splits were more consistent. However, they still need to be faster if the run is going to resemble a threshold in anything but name. My running week ended on Saturday. With a party in the evening, I wanted to get my long paced run out of the way so I didn’t have to worry about being especially fresh the following morning. My plan was to run 20 miles at an average of 7-minute mile pace. One of the problems I find with long runs is that I tend to set off too fast and pay for it later, so I was determined to try to regulate my pace better than my last long paced run. Although the first mile along the roads up to the Lee Valley passed in 7:01, I didn’t quite keep control of the pace as I wanted. I passed the first few miles trying slow down, but finding that I was clocking each mile at sub-7 by a decent margin. However, I was feeling good, so focused on using my legs more than my arms, keeping my breathing even and landing mid-foot. I’d set off late, so spent the second half of the run chasing the sunset and returned home in the dark. I was thirsty, but didn’t feel ragged and didn’t have the kind of leaden legs that sometimes characterise my long runs, and I’d kept to an average split of 6:49. Which begs the question: What’s the difference between a threshold run, a tempo run and a long paced run? I think that my speedwork holds the key to improving the speed of my faster runs, and although it may take time for this to start to make some impact I clearly need to make sure I’m pushing sufficiently hard. This may mean ditching the backpack for the Tuesday repeats, which may only be a minor inconvenience. I may even take to a lunchtime speedwork session to see how that affects things. Either way, my focus is on running faster rather than fretting over building distance, which is a good place to be when you still have a little over two and a half months to race day. I am no expert and I am considerably slower than you, but given your terrific 20miler training pace it would seem that your threshold pace might be a lot faster? I find the only way to keep a decent pace during marathon training is a weekly killer interval session – I am following an excellent one that works out your interval pace off your 10k RACE pace e.g. 400m is 10k race pace minus 60secs (for me that is 7:15/mi down to 6:15); 600m is 10k minus 55secs and so on…right up to 1600m (1mile) which is 10k pace minus 35secs. The rest intervals are usually 1-2mins depending on the amount of intervals and the distance, but I am always able to finish yet totally spent at the end!! But it looks like your well on top of this running malarky and need no input from me!! Sounds like a recipe for a good tough workout!